BD 43/25 C Bp Pack 15154030 https://www.kaercher.com/tn/professional/floor-scrubbers-scrubber-dryers/scrubber-driers/walk-behind-scrubber-driers/bd-43-25-c-bp-pack-15154030.html The BD 43/25 C Bp Pack is a battery-operated (76 Ah) scrubber drier with disc engineering, particularly useful for maintenance and deep cleaning of surfaces of up to 900 m². 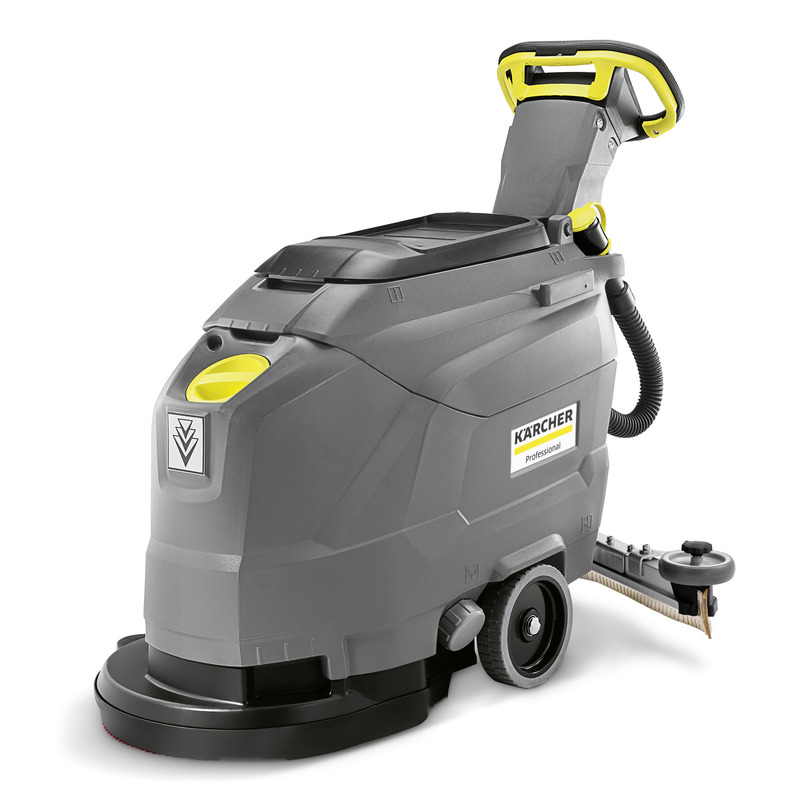 The BD 43/25 C Bp Pack is a battery-operated (76 Ah) scrubber drier with disc engineering, particularly useful for maintenance and deep cleaning of surfaces of up to 900 m². Our walk-behind, battery-operated BD 43/25 C Bp Pack scrubber drier with disc engineering has a working width of 43 cm and a tank volume of 25 litres. This makes it ideal for economical deep cleaning and maintenance cleaning on surfaces of up to 900 m2. Its agility and manoeuvrability are ideally suited for cluttered surfaces. Straight or curved squeegees are optionally available for fine-tuning the machine to the prevailing ground conditions. It is operated with a 24-volt battery with 76 Ah capacity; a separate battery charger is included. The EASY Operation system, with its the characteristic yellow control elements, ensures easy operation and very short teach-in times. Moreover, cleaning and maintenance of the machine are just as easy.